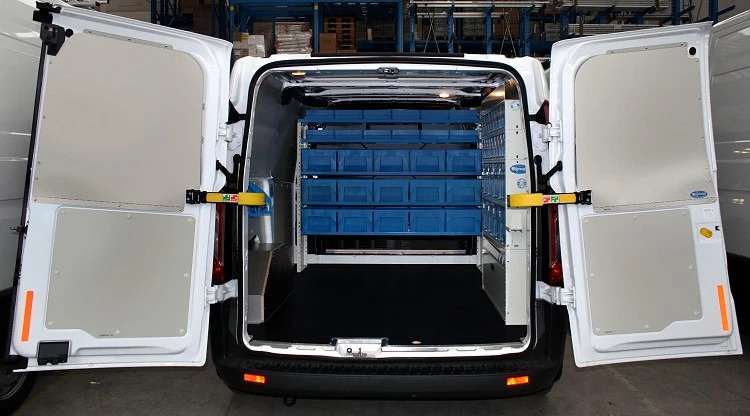 For years the Syncro group has been upfitting vans, and over the course of these many years, we have continued creating innovative solutions to make the very best products in terms of functionality, durability and weight, including extremely lightweight components. All materials (plastic, aluminum, high-resistant steel, special plywood) are meticulously chosen so that each product obtains the optimal balance between functionality, durability and light weight. 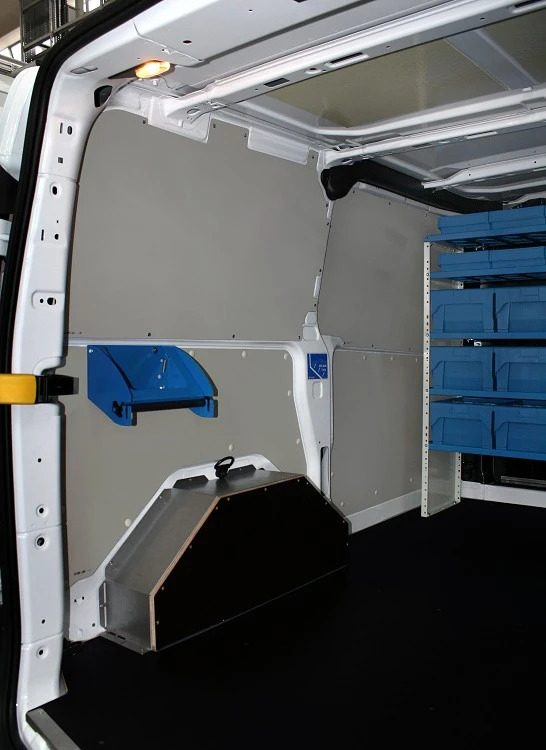 The first step in a van upfit is the floor panel, that has multiple function needs: a solid base for installing the racking units, and providing the van load space with a durable, flat, solid floor that protects the van from daily wear, and tear and denting. On this Custom, we mounted the 12 mm pre-coated, CNC laser-cut, plywood floor, complete with non-slip steel borders. The cargo walls have been protected with modular paneling in pre-coated, galvanized steel sheets that protect both the side walls and the doors of the Custom. The left-hand side wheel arch is protected by a wheel arch cover specially made of 2 mm galvanized steel and 12 mm plywood. Examining the racking units on this upfit, we see that the owner of this Custom needs lots of free cargo space. 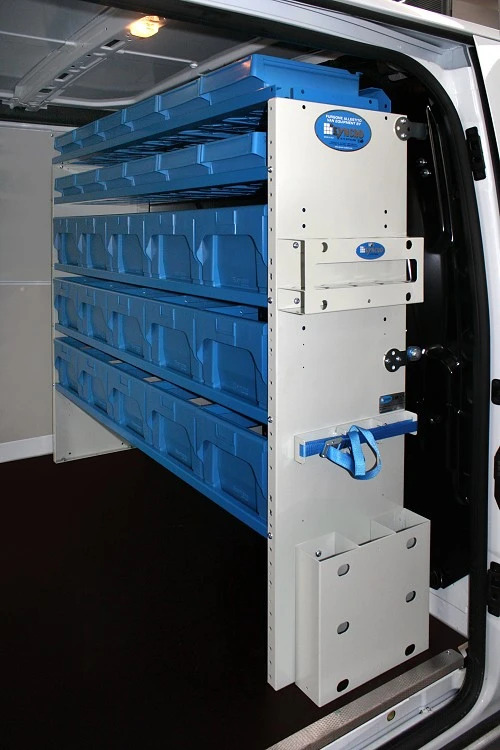 For this reason, the Syncro technicians mounted a 160 mm drawer unit over the right-hand side wheel arch base frame and another shelving unit in the back of the cargo area parallel to the bulkhead. 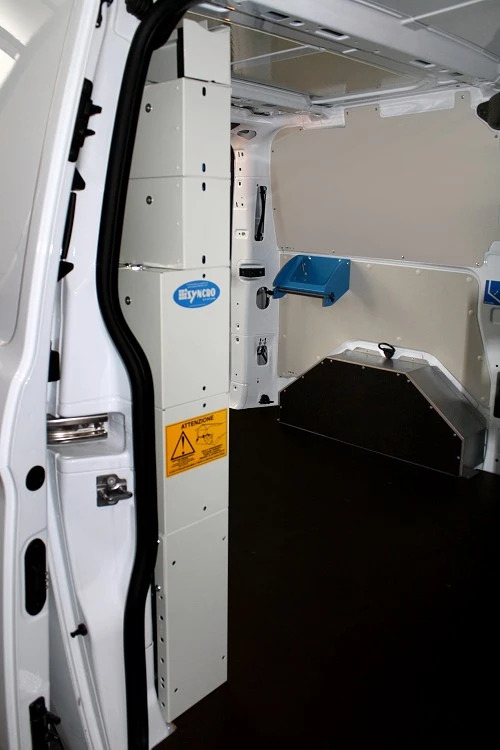 The upfit on the right-hand side consists of a narrow wheel arch frame, with a door panel that allows the space around the wheel well to be used as handy storage. 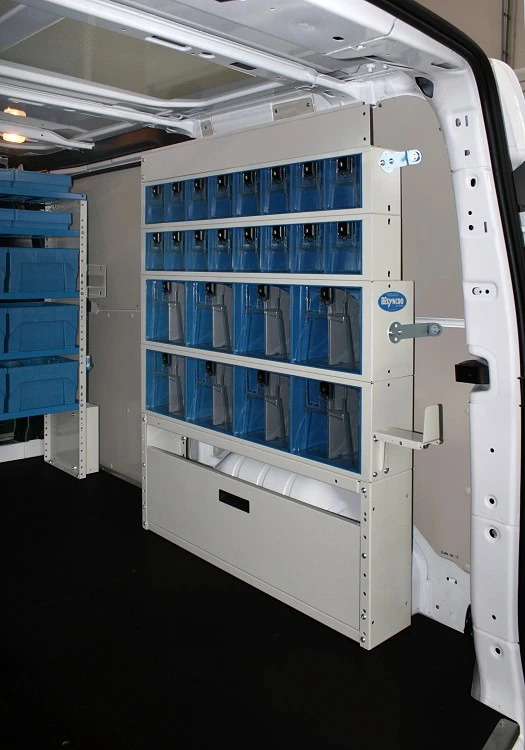 The newly designed door panels use an innovative rotational sliding system that takes up less space and allows for wide-open access to storage spaces. 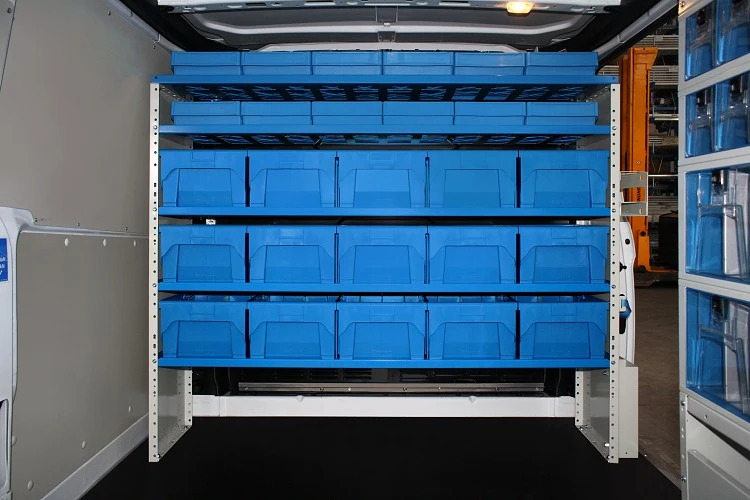 The upper part of the racking units on the right-hand side has a series of clear plastic drawers, each complete with individual locking system. It's a perfect solution that takes up minimal space, and saves time by letting the user easily see the contents of the drawers without opening them. In this unit, there are 8 drawers with a height of 240 mm and 16 with a height of 161 mm. The large drawers come with aluminum dividers. Altogether storing up to 32 different small parts and fittings. At the very top of the racking unit, we mounted a long shelf with raised angular sides for secure transport of extra long objects. The shelving unit along the bulkhead of the Custom is made up of a series of shelves with extractable plastic bins. Along the bottom, we inserted 15 CAS35 bins, each with four handles and an aluminum divider. The polypropylene containers are extremely practical. They can be carried either by using the two handles on the shorter sides built into the plastic design, or the other two which are similar to those of supermarket basket handles. At the top, there are 12 polypropylene containers, with two dividers each. Amazingly, with a width of just 35 cm, 54 different types of small parts and fittings can be safely stored and transported. To improve safety and functionality, we added some practical Syncro accessories. On the end right-hand side racking unit, we mounted an extendable steel arm hook, and facing the side door, on the end panel of the shelving unit along the bulkhead, we mounted a spray can holder and metal secure storage compartment for elongated objects. Last but not least, a paper towel roll holder was mounted to wall on the left-hand side near the back doors. Click here for Custom upfits, an example of an upfit with drawer units, a Custom L2 upfit, pictures of an internal paneling and linings for the Custom.